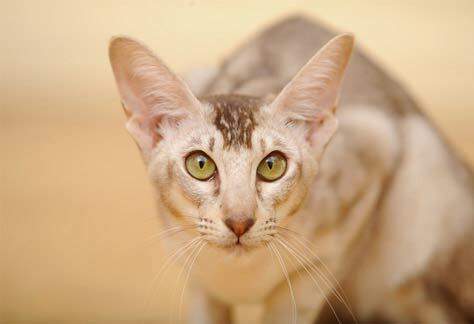 Orientals cat breed information and advice. Orientals are very much people cats and will definitely keep owners on their toes. Sometimes referred to as 'the Siamese in fancy clothes', Orientals share much with their Siamese cat breed cousins, including an athletic body type, colours, amusingly large ears - and a very naughty streak! Carol Ward, chairman of the Oriental Cat Association, says: "Oriental cats make excellent pets. They are lively, extroverted, talkative and attention seeking." As with many foreign breeds, Orientals are very curious and will investigate anything they think could prove fruitful - from handbags to cupboards and shelves, and their expert climbing skills mean even tops of wardrobes are not safe. Carol describes them as being like "naughty children - into everything and always on the go" and you also need to be wary as any small objects not bolted down may mysteriously disappear from time to time... "Many times the odd £5 note left out for the window cleaner or the milkman mysteriously disappears, to be found weeks later 'posted' under a little-used spare bedroom door!" Carol laughs. Like the Siamese, Orientals will also make sure their voices are heard when they have something to say, and will have a nice long chat with you about your day when you come home - and you can be sure they will tell you all about theirs! "They answer back when spoken to, wake you up in the small hours of the morning when they feel peckish and can be trained to do tricks, such as retrieve objects thrown or rolled away from them," adds Carol. "If you are tolerant of these foibles and want a cat to constantly amuse you, then the Oriental cannot be beaten." Orientals come in both longhaired and shorthaired varieties, with the longhaired beauties having lovely silky, flowing coats, while shorthairs have short, close-lying fur - read our Oriental Longhair Cat Breed Profile. There are an incredible 300 colour and pattern combinations to choose from. Carol explains: "The coats of the Oriental now come in solid colours ranging from black, blue, lilac, caramel, cinnamon and fawn. The red series has bright red coats, with diluted versions in paler cream and apricot, and of course the tortoiseshells." These colours also come in tabby and silver versions, while the chocolate and white Orientals now have their own names - the former is known as the Havana and the latter a Foreign White. Orientals have graceful, athletic bodies with long legs, a flowing tapering tails and neat little spoon feet. They have the same triangular shaped head as the Siamese with large ears set at the 'ten-to-two' position with bright green slanted oval eyes. Healthy Oriental kittens should be big and strong with well filled out bodies (but not pot-bellied) with shining coats and clear eyes. Kittens suitable as pets should be inquisitive and willingly come to you, climb on your lap and purr when stroked. When you go to visit your breeder, ask to see the mother of the kittens and, if the breeder owns the stud cat, ask to see the father too. "Kittens are not sold by reputable breeders under the age of 13 weeks," Carol advises. "They must be fully vaccinated and the buyer should be shown a full vaccination certificate, showing the first and second doses of vaccines for cat 'flu and enteritis as a minimum. It's best to ask your own vet what should be included on the vaccination certificate before you purchase." Responsible breeders will also ask you lots of questions about your home and lifestyle to make sure you are a suitable candidate for their kittens. Expect to pay upwards of £400 to £500 for a pet quality Oriental kitten, and make sure you buy from a reputable, Governing Council of the Cat Fancy (GCCF) registered breeder. In general, Orientals are said to be a hardy breed that does not suffer any major inherited health issues, and can live well past the age of 12. "They do not need special diets and enjoy the full range of proprietary cat foods found in supermarkets and pet shops," Carol says. "However, like all cats they do not tolerate cow's milk - simply have a bowl of clean water always available." Longhaired Orientals need a little more grooming than the shorthaired variety - which will only need a quick weekly brushing - but as they do not have a dense undercoat this will not be difficult. It is thought that many of the descendants of the modern-day Siamese had a 'self' pattern with green eyes, but when several solid 'Siamese' were imported to the UK in the 1800s, it was decreed by Siamese breeders that true Siamese were 'pointed' with blue eyes, so they decided these cats were a different breed altogether. The earliest known record of a self-coloured brown shorthaired cat was in 1894, but the first volume of the Siamese Cat Register published in 1924 listed three black cats of Siamese-type born in the 19th century. The first semi-longhaired Oriental was officially recognised in 1974 and the breed was given GCCF championship status in 1977.